Israeli archaeologists find the evidence — a skull and hand — in a cave in the hills. The earliest evidence of blood vengeance has been discovered in a cave in the Jerusalem hills. The findings of a joint study by the Israel Antiquities Authority, Bar-Ilan University and Tel Aviv University were presented Thursday, May 17, at the 44th Archaeological Congress at Ben-Gurion University of the Negev, in cooperation with the Antiquities Authority and the Israel Exploration Society. 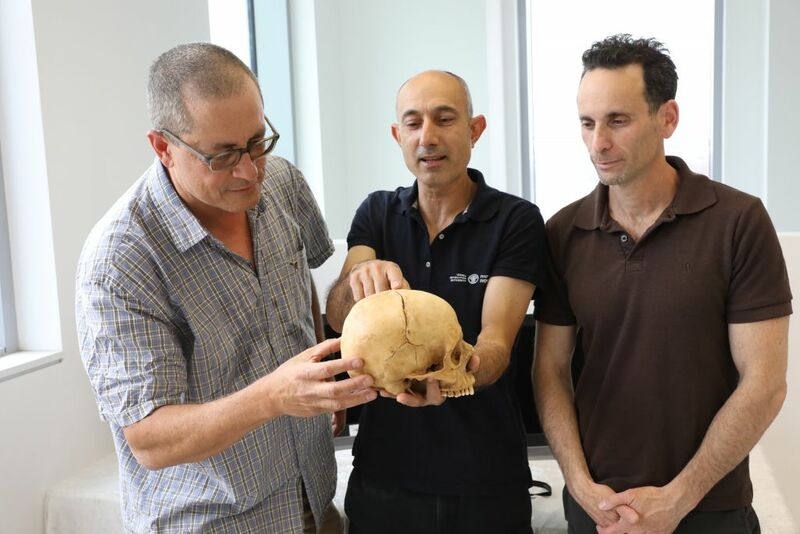 In an archaeological survey conducted in the cave, Bar-Ilan professor Boaz Zissu discovered a human skull and palm bones dated to the 10th or 11th century C.E. Yossi Nagar, an anthropologist at the Israel Antiquities Authority, and Haim Cohen of the National Center for Forensic Medicine and Tel Aviv University identified the bones as belonging to a man 25 to 40 years old. “The skullcap shows signs of two traumatic injuries that eventually healed — evidence of previous violence experienced by the victim — as well as a small cut mark caused close to the time of death and a blow by a sword that caused certain and immediate death,” the researchers reported. A morphological examination of the skull shows a great resemblance to the local Bedouin population and is consistent with historical knowledge that in the period under discussion, some 1,000 years ago, the Jerusalem hills were inhabited by a Bedouin population that came from Jordan and northern Arabia. A text from the beginning of the 20th century tells the story of a case of revenge in which the murderer presented his family with the skull and right hand of the victim to prove that he carried out the commandment for blood vengeance. These are precisely the parts of the body discovered in the cave. Because the person had been involved in violent incidents and died from a fatal blow, the researchers concluded that they had found the earliest evidence of blood vengeance.